Mix’n’match is a memory game that combines sound with images and movement when you find pairs in the game. You can either play one of the preprogrammed games or make your own. For instance you can play the preprogrammed game, where you have to match animals’ names to their sounds by stepping on the physical spots and listening to the content on them. As the game progresses, it is important to remember the content on the different spots to match all the pairs. When you produce your own content in Mix’n’Match using the record- and camera function on the iPad you can use it for all school subjects and on all school levels – that’s a fast and easy way of creating targeted teaching with movement. Mix’n’Match can be played in English, Danish, German and French. The Chase is a fun movement, where you can really get your heart rate up. The game is played in two teams that each have to catch the characters Grace and Ralph who pop up on the spots in the form of green and red light, to score points and beat the other team. You catch the light in different ways in the 30 different levels: in the first levels you catch the light by stepping on the blinking spots, and as you unlock more and more levels you have to do jumping jacks, sit on the spots, press them with your hands etc. to score points. The Chase is a fun and popular brain breaker that renews energy and motivates players to move no matter their age. Sequence is a fun cognitive training game where the players have to remember the order of the spots. The game can be played solo or in teams. The first player steps on a spot and the next player steps on the same spot and adds a new one. Player 3 steps on the two added spots and adds another new spot, and so on. For every round a new spot is added and the players have to remember the order. It goes as far as 20 spots! If a player makes a wrong step the game starts over. Code a Spot is an open platform that allows children and teachers to programme the light and sound on the spots using the iPad. On the iPad you can choose the light and sound for all of the 12 different Hopspots-spots, or you can use the record function in the iPad to record you own sounds for the game. You get to decide whether the spots should be controlled from the iPad or by stepping on the spots. Code a Spot provide endless possibilities as you get to decide how many spots you want to use and what for. It could for instance be used for making you own interactive stories that are combined with movement. Flow Dance is designed by pupils at Uglegårdsskolen in Solrød who beat three other Danish schools in an innovation contest about developing a new game for Hopspots. Flow Dance is a game that combines dance and music. By jumping on the different spots the pupils can create their own music within the genres: Pop, Latin, Jazz and Middle Eastern music. The rhythms are recorded and afterwards used to choreograph a dance in which they can challenge each other. The Island is an interactive story- and game by Danish author Boris Hansen. It combines active play and storytelling with an introduction to classic social science issues about everything from democracy to equality, crime control and so on. In this game the group is stranded on a deserted island, where they have to figure out a line of dilemmas in order to survive. The Island is a game for the 4th to 9th graders, and it takes place partly on the iPad, where the children read and listen to the story, and partly on Hopspots, which is used for physical collaboration exercises such as catching fish and exploring the island. 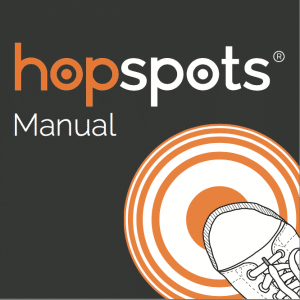 You can download the Hopspots Manual here. It shows you what Hopspots consists of, how it works, and provides guidelines for use etc.